Crispy golden brown on the outside and soft and tender on the inside, these roasted parmesan potatoes are destined to be a new favorite side dish. More than Ugg boots, cozy sweaters, and crispy cool Fall afternoons there is nothing I look forward to more this time of year than cranking up my oven and roasting something delicious. So after a long hiatus, also known as a hot and humid summer that made turning on the oven as appealing as sticking a fork in my eye, the blessed time of year has finally arrived. 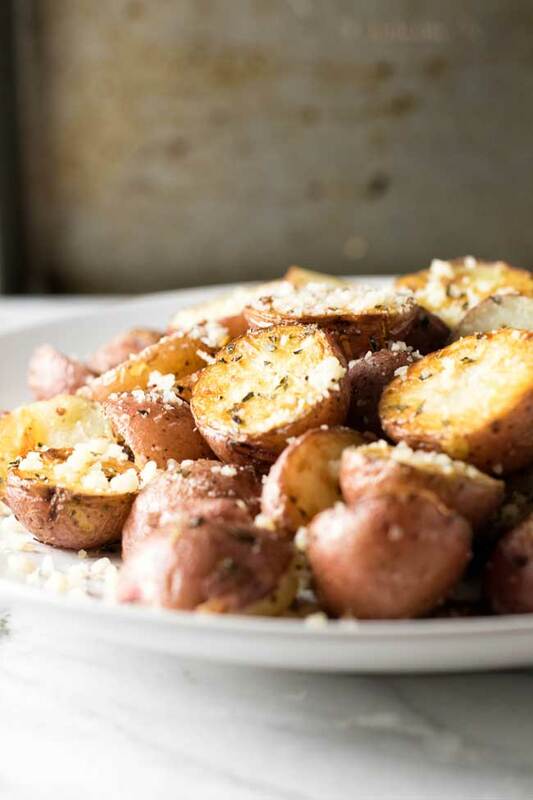 Golden on the outside, soft and tender on the inside these roasted parmesan potatoes are a side dish dream. Easy to make they require only a few simple ingredients and pretty much go with any main dish – chicken, beef, and pork dishes all love roasted potatoes – and, bonus! any leftovers are amazing reheated the next morning alongside some eggs and bacon, so consider doubling the batch to make that happen. They’re delicious tossed in some herbes de Provence, salt and olive oil, but I also like to add a sprinkling of freshly grated parmesan cheese after they emerge hot and crispy from the oven. I like to use small new potatoes – they hold their shape well and I love their red skins. 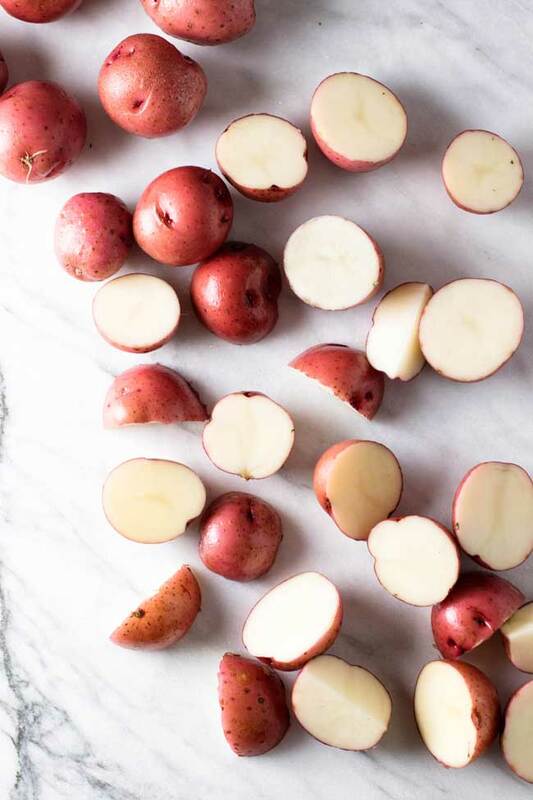 Look for bags of new potatoes in the produce department and slice each in half before roasting. Herbes de Provence is a dried herb mix made with oregano, lavender, thyme, rosemary and other herbs and I never roast a potato without a generous sprinkling of it. Sprinkle finely grated Parmesan cheese over the hot potatoes before serving. 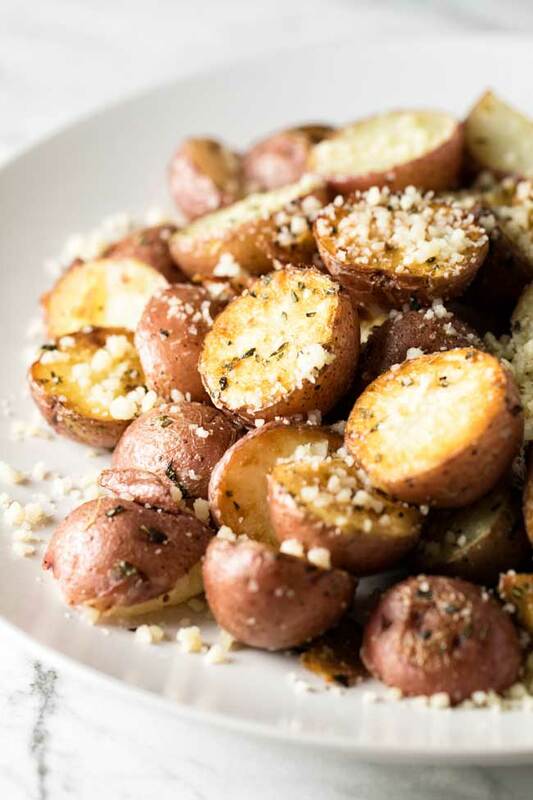 Hot and crispy roasted potatoes tossed in herbs and topped with a sprinkling of Parmesan cheese. Preheat oven to 425°F. Drizzle the olive oil over a sheet pan. Add the potatoes and sprinkle the herbs and salt over the top. Toss the potatoes to coat them evenly in the oil, herbs and salt. Roast the potatoes for 20-30 minutes giving them a toss/flip halfway through. Transfer them to a serving platter and sprinkle the cheese over the top while they’re hot. 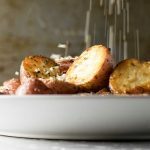 Roasted potatoes are pretty much a fall staple at my house but I’ve never thought to add parmesan…definitely trying these next time! Looks great, April! I’ll be making these quite soon. Perfect to keep in mind as the weather turns. Brrr.